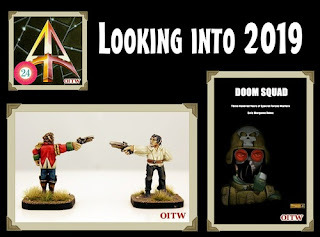 On Christmas Eve the great website Orcs in the Webbe revealed an article by myself which told of what is going to happen in 2019 at Alternative Armies. You can find the link to this article by clicking through to our blog. Possible projects such as the new game 'En Garde' (follow up to The Duel) and Hazabot (clear the space station) as well as confirmed new systems like Sengoku Rampage (big Japanese Myth) and Doom Squad (solo play special forces) and USEME. New miniatures such as Elf Pistol Duellists, 28mm Giant Spiders and RUFUS too.